Blink and you’ll miss it- Flash events have returned! If you’re new to Flash events, here’s a quick primer: Flash events last for 1-2 hours and repeat several times over a few days. This time around, your Ewoks answer the call of battle in this multi-tiered event. Power up your Squad and earn gear as you contend with Imperial enemies, Bounty Hunters, and Droids. The true might of your small Squad is tested in the final (and difficult!) BONUS tier, so be sure to be ready! Strange invaders have leveled a nearby village and encroached on Ewok territories! 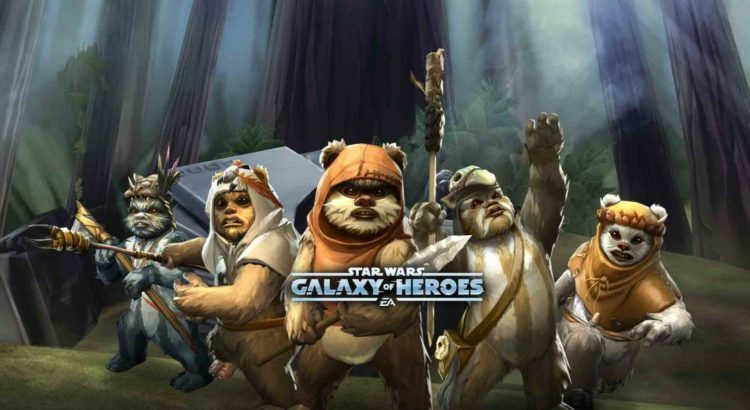 Join forces with the newest Ewoks to join Galaxy of Heroes: PAPLOO and LOGRAY. Earn their respective shards and Familiarize yourself with each new Ewok’s respective abilities as you contend with various Troopers. Keep on your guard as something more roams the forest, seeking you out. Going forward, all Marquee events will employ the same level banding functionality seen in Flash Events. What this means is that every Marquee event you play will contain all tiers in your level range. For example, players at level 25 will now see 4 missions they can complete, rather than several missions too high level for them to participate in. Likewise, players at the level cap will have 4-5 missions which are tuned appropriately for them. Happy Mod Anniversary! Are you ready to power up your play? Mod Set packs are available for a limited time. Each pack features a full mod set (per class) plus a BONUS Tier A (Gold) mod from any slot. Get them while they last! Additionally Ahsoka Tano (Fulcrum) is now available in the Chromium Pack and standard Shipments. Add this Star Wars Rebels character to your collection today! The Military Might Assault Battle event has had its rewards overhauled. Rewards are now similar to Places of Power. Each victory in this event will yield ship ability materials, ship training droids, 4 shards of a non-pilot Empire character, and 5 shards of a pilot empire character paired with 4 blueprints of their ship. In cases where a ship has multiple pilots such as the TIE Reaper, only one pilot will be granted. (Non-primary pilots are still possible rewards in the general character pool.) As part of this overhaul, Darth Vader, TIE Advanced, Gar Saxon, Imperial Super Commando, Gauntlet Starfighter, and TIE Reaper have been added to the reward tables for this event. Ewok Elder: The Omega upgrade for “Guiding Strike” will now grant Turn Meter to non-Ewok allies when he is the only Ewok present. Ewok Elder: “Tribal Healer” will now animate correctly. General Kenobi: “Lead the Charge” animation now attacks towards the targeted enemy. Teebo: “Stealth Takedown” will now remove Turn Meter after dealing damage. Fixed an issue where the Empire Hallway environment was no longer showing reflections for characters. Wicket rounds out this Ewok invasion as he makes it onto the terrain of battle!